“Gezundheit! !”, I hear you say. Thanks, but no, actually Basbousa is the name of a sweet, and a delicious one at that. There are many versions all over North Africa. Why do I mention this? Another ‘ask Kurma’ submission, of course. If you go to google and key in ‘ask cooking’, you’ll find me, a few links down. Remarkable. I receive 2 or 3 a day, from around the world. Here’s my recipe for the Egyptian variety I sent her. 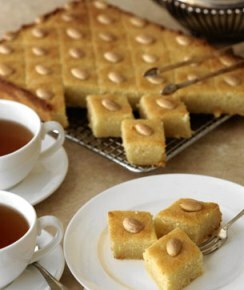 The Middle East has a long tradition of delicious sweets. Whereas some are time-consuming, this delectable one is a breeze to prepare, and is especially suited to cooking in big quantities. In some ways basbousa reminds me of a firm, sliceable version of Indian halava, but it’s easier to make, and according to some friends who recently dropped by our test kitchen, even better. Basbousa is at the peak of perfection if it’s left to soak overnight. Serves ten or more. Note: You may wish to decorate the sweet with blanched almonds before baking. 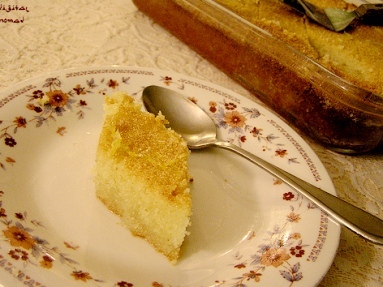 Preheat the oven to 175° C / 345° F.
Whisk together the semolina, coconut and sugar in a bowl. Add the butter and milk and mix until well combined. Pour the mixture into a buttered, shallow, medium-sized dish. Bake for 30 minutes, or until lightly golden brown. Prepare the syrup: slowly dissolve the sugar in the water in a medium saucepan over low heat. Increase the heat to moderate and boil the syrup until it reduces by about one-third, or until it just coats the back of a spoon. Add the lemon juice. Cut the completed cake into diamond shapes while it’s still hot, and pour the hot syrup over. It will seem like a lot of syrup, but it will all gradually soak in. Serve at room temperature. Best the next day.